All source images for printing are at a minimum of 300 pixels per inch. For example, source images for A2 art prints at 21.33" *16" would be 6400*4800 pixels. All images are available for publishing under license on request, POA from 5p to 20p per impression depending on the particular instance. Example publishing includes use in books, magazines, compact disk covers, film, television and electronic media etc. For publishing, our images can be made available at custom sizes up to a largest dimension of around 12,000 pixels. The standard A4, A3, A2, A1 and A0 sized art prints are created using an Epson inkjet photo printer. A4 size prints are available in matte only, the other standard sizes are available in matte or gloss. Giclée prints on canvas are only available in one size which is approximately 24" by 18" depending on the image aspect. This size is slightly larger than A2. The giclée art prints on canvas are only available in matte. Durst Lambda prints are only available in one size which is approximately 24" by 18" depending on the image aspect. This size is slightly larger than A2. Durst Lambda art prints are available in matte or gloss. David Makin was born near Wigan in the North-West of England in 1962 but has been living in North Wales for some 20 years. His first introduction to fractals was through the well known "Fractint" software in 1999. He was immediately hooked on both the Art and Math of fractals and has spent most of his spare time working with them since. He initially wrote his own fractal software "MMFrac" but moved over to serious use of the popular Ultrafractal program in 2001. David writes formulas for Ultrafractal as well as using it to create 99% of his fractal art prints. His main aim is to show off the incredible diversity of form possible in the Fractal medium and always to seek the "different". David's image "Starfruit" was a winner of the International Benoit Mandelbrot Fractal Art contest 2006. His image "Theme Park 2" was a winner of the International Benoit Mandelbrot Fractal Art contest 2007. David has had work published on two book covers, a CD and has also been featured in the monthly IEEE publication "Computer Graphics and Applications". By day, David is a computer programmer developing mobile phone software. David has previously been working with escape-time fractals but more recently has started working on 2D and 3D IFS fractals including both static art and animations, you can expect to see the results of this here at Fractal Gallery some time in the near future. 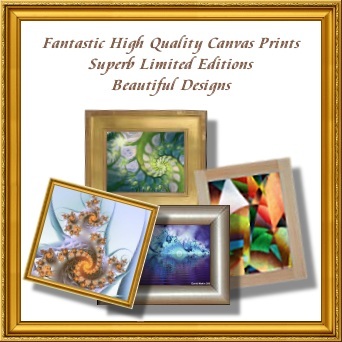 All art prints are shipped without picture frames, this saves you money on shipping costs and enables you to personally choose the correct frame design and colour to complement your fractal art prints. Fractal encompasses any object that has similarity at different scales and orientations. Classic examples of "real-world" fractals are ferns, broccoli, clouds and even coastlines and mathematical fractals can be created that replicate natural phenomena. Fractal art is generally an art created from mathematical formulas by digital artists using software specifically written for the creation of complex fractals. There are various types of mathematical fractal including escape-time fractals, IFS, flame fractals, L-systems and others. Each type is artistically distinctive in form. Benoit Mandelbrot (a Polish Mathematician b.1924 but who moved to France when young) coined the term "Fractal" in 1975: A fractal is generally "a rough or fragmented geometric shape that can be subdivided in parts, each of which is (at least approximately) a reduced-size copy of the whole", a property called self-similarity. One of his tutors was Gaston Julia, French Mathematician 1893-1978. "Although he was famous in the 1920s, his work was essentially forgotten until Mandelbrot brought it back to prominence in the 1970s through his fundamental computer experiments." An interesting and remarkable fact is that Gaston Julia investigated fractals without the aid of computers (in the 1920s). Julia and Mandelbrot mainly investigated escape-time fractals. Mandelbrot's method: z0 = (0,0), z1 = z0^2 + pixel, z2 = z1^2 + pixel, z3 = z2^2 + pixel and so on. As iteration progresses the new z value (zn) will either become progressively larger (tend to infinity) or it won't. The Mandelbrot "Set" consists of points that do not tend to infinity and are not normally coloured in Fractals. Julia took the start value from the pixel and used a fixed constant as the value to add. z0 = pixel. z1 = z0^2 + constant, z2 = z1^2 + constant, z3 = z2^2 + constant and so on. In fact for every pixel on the Mandelbrot version there is a corresponding Julia version. This is interesting from an artistic viewpoint because the geometric detail in a given Julia matches the geometric detail from near the corresponding position on the Mandelbrot. True fractals require infinite iterations but obviously that's not feasible, so fractal software has to have ways of stopping iteration and deciding whether a given pixel is "inside" or "outside" the "Set". To test if a given pixel is "outside" is done quite simply - if at any time the new z value has a magnitude greater than a given test value (bailout value) then that pixel is assumed to be "outside" i.e. it's assumed that the iteration values are tending to infinity, this is where the phrase "escape-time" comes from. For "inside" pixels this outside test would never stop the iterations, so for "inside" pixels we simply limit the number of iterations performed for a given pixel. If the calculations for a given pixel reach the maximum iterations count without the pixel "bailing out" (i.e. passing the "outside" test) then we assume that the pixel is "inside". The larger the bailout test value used and the more iterations allowed before deciding a pixel is "inside" then the closer to the true fractal the resulting image will be. *The* "Mandelbrot Set" is used to mean the fractal generated from z=z^2+c using Mandelbrot's method. *A* "Mandelbrot Set" is used to mean a fractal generated from a general iterated formula using Mandelbrot's method. Similarly *the* original "Julia Sets" are any fractal generated from z=z^2+c using Julia's method and "a Julia Set" is used to refer to a fractal generated from a general iterated formula using Julia's method.